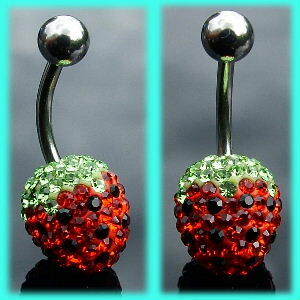 Strawberry belly bar which is set with lots of red, green and black crystals, these disco ball belly bars are available in a 6mm, 8mm, 10mm or 12mm size. These crystal belly bars have a 1.6mm (14g) surgical steel bar and a 5mm screw on top ball. If you fancy adding a bit more sparkle to this navel bar you could try a jewelled top ball instead. The best eCommerce software by ShopFactory powers P10005. All-in one eCommerce and shopping cart software.